Happy Birthday Disney’s Hollywood Studios!!! I wanted to celebrate Hollywood Studios Birthday with a look at a few of my favorite details and memories from around the park. Wordless Wednesday – Muppets are serious about safety! Wordless Wednesday – Was it you? Yesterday the ‘Pixar Pals Countdown to Fun’ Parade stepped off for the first time at Disney’s Hollywood Studios. The ‘Pixar Pals Countdown to Fun’ replaces the popular and high energy ‘Block Party Bash’ Parade with a lack luster eight minute blink and you missed it “parade”. Starting time – Both parades begin at 3:00 pm. Starting location – Starting on Hollywood Boulevard and ending near Star Tours the route snakes its way around the center of the park. Slightly rethemed parade floats – The large floats are all the same, while the smaller floats have gotten a fresh coat of paint. So if all that is the same, what’s new? Music – The songs we all loved to hate have been replaced by a tweaked “I Don’t Want to Work”…over and over again. Characters – While the large floats have the same characters from The Incredibles, A Bug’s Life, Monster’s Inc, and Toy Story, Carl, Russell, and Dug from Up, Remy from Ratatouille, and Lotso from Toy Story 3 have been added. 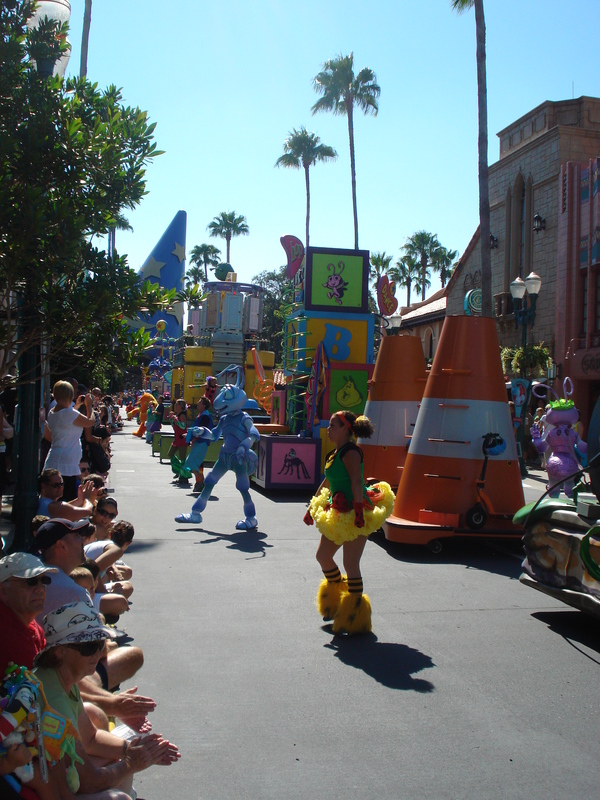 While I really enjoyed the characters that were added, but I can’t help but miss all the excitement that ‘Block Party Bash’ brought to the streets of Hollywood Studios. Last night I was able to do something that I have been wanting to do for a loooong time…I got to see the Osbourne Spectacle of Dancing Lights!!! It was dusk and I knew what was waiting for me right around the corner as I approached the BAH…and suddenly I was walking faster and I saw my first peek at the lights. I was a little worried that I would be overwhelmed by the amount of lights and people that I knew that I would find on the Streets of America, but once I was there none of that mattered!!! The lights are absolutely beautiful, and when the snow falls (during the non-dancing lights songs) it feels perfect. This year Phineas & Ferb make a cameo into the dancing light sequence, and it is perfectly placed addition to this experience. There are vendors selling Christmas cookies and hot chocolate, as well as 3D glasses that enhance the lights. The glasses can be purchased at Youse Guys Moichendise, but almost seem unnecessary as the lights hold their own. If you haven’t had the chance to see the Osbourne Spectacle of Dancing Lights, you should do so…NOW!!! I also want to thank Todd Perlmutter, Cheryl Perlmutter, and Matt Hochberg for showing me around and pointing out things that I shouldn’t miss! I hope that you enjoy these pictures!!! So for today’s outing I decided to head on over to Hollywood Studios, and boy was I glad that I did! For some reason we ALWAYS end up not being able to watch the Osbourne Spectacle of Dancing Lights, and I am soooo excited to be able to see them this year. I will warn you, that I went a little nutty taking soooo many pictures!!!! Zoe is a huge High School Musical fan, and when I heard that they were replacing one of her favorite shows at Disney’s Hollywood Studios I was a little nervous that my little Wildcat would be disappointed in its replacement. So I decided that I would give it a shot, and went down to the BAH to give “Disney Channel Rocks!” a look-see. Well I can report, that I really loved it! It is a high energy show that features several songs from both Disney Channel shows and movies. I was pleasantly surprised at their song selection, and being a new fan to the mash up (Thank you Glee!) their arrangement was flawless. As the stage rolls down Hollywood Boulevard, the party has begun and songs are blasting from the stage. Rolling up to Keystone Clothiers, the dancers run out in front of the stage from the crowds to join into the concert. Before the stage moves into its final position in front of the Sorcerer’s Hat, the crowds are held back to make sure that no one gets hurt. Once everything is in place, everyone is walked into place for the concert. There really isn’t a bad place to view the show from, so you really don’t need to be up front to take it all in. The show features songs from Camp Rock 1 & 2, Jump In, The Cheetah Girls, Starstruck, and High School Musical. The singing is amazing! I was taken aback at how well these guys and gals were able to sing and dance! Also, the dancing is SUPER high energy and really well choreographed. Even if you don’t know the songs, you will find yourself bopping around to the music. As the show concludes and is rolling back down Hollywood Boulevard, they play some more songs and instead of singing they are more like DJs introducing them. The songs were from Selena Gomez, Hannah Montana, and Demi Lovato (the usual suspects). 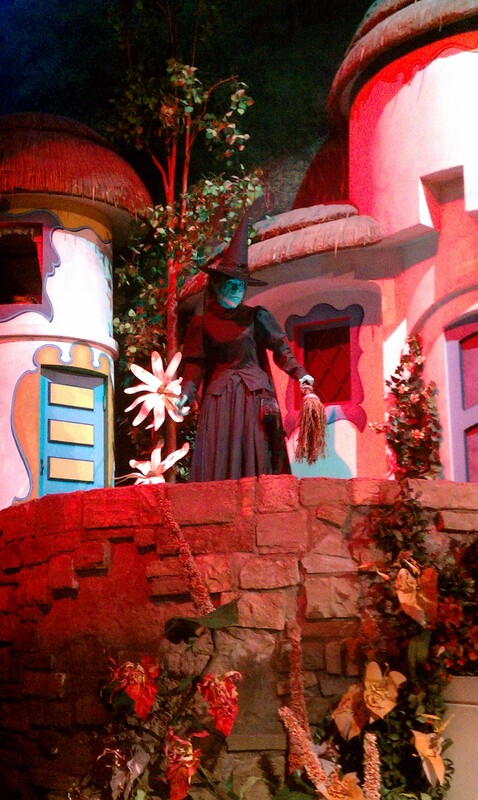 The show is performed daily at 10:000am, 11:00am, 12:00pm, 1:00pm, 4:30pm & 5:30pm. While I did not know all the songs and I haven’t seen all of the Disney Channel Movies that are featured, I really enjoyed the show! The performance quality is really high, and I know that my little Wildcat will have a new favorite show! Here are some pictures that I took at the show…I hope that you enjoy them!!! With Block Party Bash coming to a close in January 2011, I thought that I would swing by and check it out since I absolutely love this parade! Now while I totally understand the point of view of those that wish that they could see the whole parade, I absolutely love the energy of the show and the life that it pumps into the Studios. A look down the Hollywood Boulevard. There is just something about seeing the Hollywood Boulevard area lined with people who are tapping their feet, clapping, and movin’ it with the performers. Now I am not knocking the parade before I see it, but I feel like a more traditional parade would absolutely juxtapose the whole vibe of Hollywood Studios. I know that the whole “working studio” thing has been long abandoned and cut away over the years, but the Citizens of Hollywood that populate that area make it a real and tangible place. I always love that at the beginning of the parade there are always older dudes with their arms crossed, leaning on the trashcans that are shaking what their Mama gave them by the end of the parade! All of that lovefest aside, I feel like the weakest link of the parade is the “Bug’s Life” float. 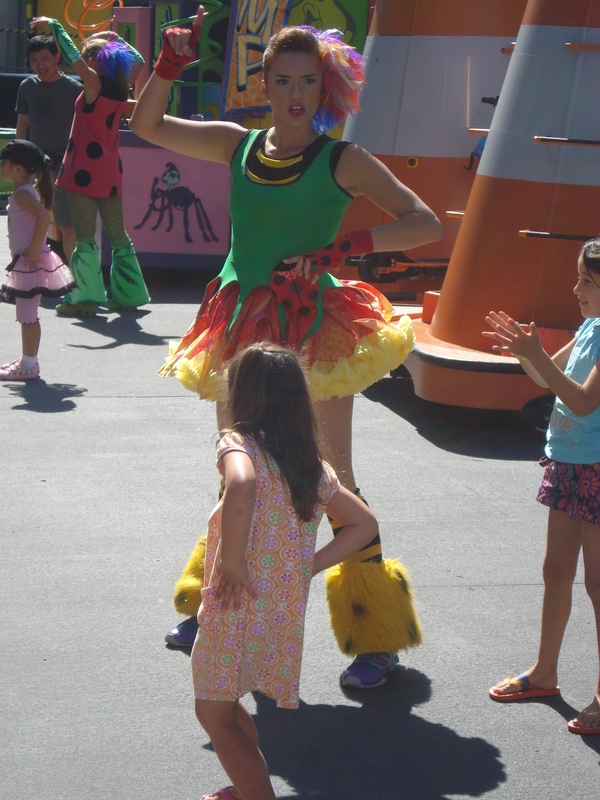 The performers definitely do their thing, but most kids don’t know or recognize those characters…or at least all of the ones that I am always around. What makes me the most excited? Having the characters from “Ratatouille” and “Up” returning to the parade! While I will be excited to see what the new Hollywood Studio’s parade has to offer, I can only hope that it captures the same sense of movement and life that Block Party Bash brings to the Boulevard!